On the sidewalk of Lafayette Street this morning, next to the city’s newest protected bike lane and across from a Citi Bike station, officials and advocates celebrated New York’s #1 ranking on Bicycling Magazine’s list of the best American cities for biking. 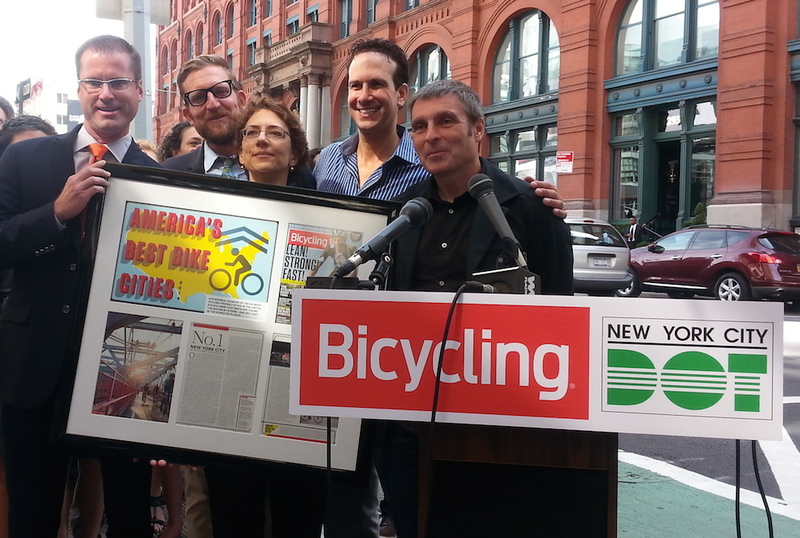 As Transportation Commissioner Polly Trottenberg accepted the honor, a question lingered: Given that so much of New York’s progress on bicycling came under the previous mayor, how will the de Blasio administration hold on to the top spot? Bicycling Magazine issues its ranking of the 50 best American cities for biking every other year, taking into account Census data on commuting, the amount and quality of bike lanes, and the political commitment to cycling, among other factors. In 2012, New York ranked seventh, with repeat champion Portland, Oregon, snagging the top spot. This year, New York leapt to the #1 slot, with Chicago, Minneapolis, Portland, and Washington, DC, rounding out the top five. Under Janette Sadik-Khan, NYC DOT added more than 366 miles of bike lanes, including 31 miles of protected bike paths [PDF], during the last seven years of the Bloomberg administration. Trottenberg said that, by the end of this year, there will be 58 additional miles of bike lanes citywide, including five miles of protected lanes. On the heels of today’s announcement, DOT released a study showing that streets with protected bike lanes have seen injuries for all road users drop by 20 percent [PDF]. “The results confirm the safety benefits of protected bicycle lanes, and that’s why DOT has committed to adding five more miles a year. And those bike lanes will be all over the city, not just in the core of Manhattan,” Trottenberg said, citing planning efforts in East New York, Long Island City, Ridgewood, and Washington Heights. “We’re looking to create robust, neighborhood bike networks,” she said. DOT will be installing protected bike lanes on Fort George Hill in Upper Manhattan, the Pulaski Bridge between Brooklyn and Queens, and Paerdegat Avenue North in Canarsie, in addition to studying requests from community boards for protected lanes on Amsterdam Avenue, Fifth Avenue, and Sixth Avenue in Manhattan. Most if not all of the projects that are definitely moving forward, however, entered the pipeline during the previous administration. Trottenberg also rattled off statistics on bike parking. This year, the city has installed nearly 1,200 bike racks, including 24 on-street bike corrals, and converted nearly 1,000 former single-space meter poles to bike racks. That brings the total number of bike racks citywide to 21,300. While I believe the rankings are very nebulous and questionable, this is the kind of attitude we need to take. It will only pressure NYC, Portland, Chicago, to do more and more! Better biking competition amongst cities is good. No one can lose. So the DOT strategy is to ease into actual infrastructure with extra-wide double-parking lanes. I’m sure that’s a comfort to those who are risking their lives in the meantime. And no plans for Park Avenue, where people are getting killed on the regular. All we need now, is DeBlasio and Trottenberg to sadle up and get the award of best biking city in the world 🙂 New Amsterdam! is there even room on Park Avenue for a biking lane? Obviously that would HAVE to be protected, given how fast the cars are moving there. But that means that they’d have to sacrifice a car-lane, unless they are gonna make the sidewalks smaller. One would think that the bike lane battles of the JSK era proved that “easing into it” isn’t necessary and that most of the opposition to changing streets was mostly made up. In fact, the longer some processes get drawn out, the more whining there is, Citi Bike being the best example of that. Change the streets quickly and people will soon forget that they were ever different. Extra-wide parking lanes that maybe we kind of sort of hope people will be willing to turn into protected bike lanes perhaps sometime later down the road are not going to earn NYC this award in 2016. And they certainly aren’t going to help the people who are biking on them now. Great to hear a firm commitment to building more protected bike lanes. Let’s hope they are connected to each other to form a network. Otherwise it’s like building a bunch of subway lines that don’t connect to each other. “They don’t answer to the city.” I’ve been saying that the public-private partnership model of Citi Bike will never allow it to become a true part of a city-wide public transportation system unless the city has a greater role. DOT basically admitting that they have no control of the process is very disappointing. “I want Citi Bike in all five boroughs”, says De Blasio. Then why don’t you have the courage to put actual resources (that is, money) into it? There was not even close to 366 miles of bike lanes installed while Janette Sadik-Khan was commissioner of the department of transportation for NYC. Sharrows are often categorized as shared bike lanes by the NYC DOT. There is no such thing as a shared bike lane. Sharrows simply indicate where a bicyclist should ride in a motor vehicle lane to avoid getting hit when a parked vehicle door is opened on the drivers side. The city of Los Angeles installed 209 miles of bike lanes and 7.96 miles of bike paths in the last four fiscal years. The LA DOT does not count sharrow installations as part of their miles of bikeway installations per year accomplishments, just paths and lanes. The Chicago DOT claims that buffered bike lanes are buffer protected bike lanes. There is no such thing as a buffer protected bike lane. If its a protected bike lane, then there is some sort of physical barrier along part of its length. As much as I want to believe it, NYC does not deserve this distinction. Biking is still considered a taboo of savages by many here. Every day on my commute drivers still honk at me and drive as close as possible to me just for thrills. Also, our bike lane network growth is stagnant to say the least. There are so many other cities which, aside from bike lanes, are just safer to ride in and where biking is more acceptable — where drivers see you as a human rather than an obstacle. Until we change the attitudes of drivers, this city is still a largely dangerous place to ride. That won’t change until the bike lanes become more than just a minority novelty. Why are they sacrificing a bike lane for another lane of congestion? It’s all about quality over quantity. We need to fill in the major gaps in our protected bike lane network, starting with 8th Ave between 40th and 43rd, Columbus Ave/9th Ave between 50th and 67th, and Broadway between 47th and 40th. These areas go from protected to zero protection in meatgrinder-style traffic and are very unsafe. Fill in these gaps, then expand our network from the East River bridges outward into LIC, Astoria, Woodside in Queens and Bushwick, ENY, and Crown Heights in Brooklyn. -We should move forward twice as fast with increasing infrastructure. -Road Diets should become Complete Streets in Phase I, not Phase 3. -Bike Share should be expanded (12,000 bikes) by the end of 2015. I would count a buffered lane on the curbside with plastic delineators as a protected lane, but not buffered lanes where cars cross the lane to park. However, I personally prefer buffered lanes to protected lanes with turning conflicts like the ones on 1st and 2nd Aves. I would love to hear more about NYPD execs getting chewed out for parking in bike lanes. It’s heartening to know that someone at the NYPD even knows what a bike lane is, let alone acknowledges that it’s not for parking. This reminds me of awarding Obama the Nobel Peace Prize. We all know there is a long way to go, but I think we deserve the award. Yes many other US cities are easier to cycle in, but NYC has come a longer way. The NYC DOT used to be openly hostile to cyclists, the Williamsburg bridge and it’s bicycle speed bumps of doom come to mind. I remember riding along streets in Manhattan the 1990’s and hitting a chickane which put so much air between me and the street that on landing several spokes went flying and I had an instant flat. Today what were once some of the most dangerous parts of Manhattan and Brooklyn are safe enough to take my children without undue worry. The 25 mph defaut speed limit was a great win for safer streets and camera enforcement of traffic laws will be transformative. I was a skeptic when getting just 20 cameras was counted as a safe streets win, but I think it has opened the eyes of a large portion of the public to the extent of the problem we face with bad drivers on our streets. Seriously. Maybe someday the NYPD will actually respect the laws they are supposed to enforce and the people they are supposed to serve and protect. This must be a joke. Sure we have come along a lot but there is no way NYC is the best cycling city in the country. We may get there some day, but this is a sever exaggeration. Not until NYPD policies and behavior reflects this. More protected cycle tracks, please. That’s the true mark of a great biking city.